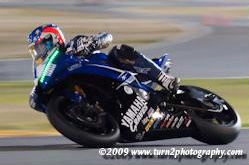 LED Strip lights used in Pro Motorsports for Team Yamaha at the Daytona 200 race. The 2009 Daytona 200 motorcycle race was run this year under the lights at night in Daytona, Florida. One of the cool additions the Motorsports Graves Team Yamaha opted for was a Flexible LED Strip of lights on the faring of each of the rider's R6 bikes. Each rider used a different color of Flexible LED Ribbon light to help the pit crews identify which rider was entering the pits. With the stock colors of Yamaha being Blue/White, the colored lit LED strip made it super easy for the pit crews to quickly identify the rider and keep thier advantage in the pits. Flexible LED Strip lighting is a very configurable, flexible and bright new eco-lighting solution offered by Creative Lighting Solutions (www.CreativeLightings.com). Our spools of LED Flexible Lighting is available on 5 meter rolls and can be cut/separated every three LEDs. The product has a 3M double sided tape on the back side which allows the LED Tape to be stuck to just about any surface semi-permanently and runs off 12 volts DC. Many motorcycle riders are opting for installing our Flexible LED Strip lighting on their motorcycles, cars, trucks, boats, homes or more. The waterproof version encapsulates the LEDs in a superflexible, waterproof silicone gel that finishes and protects the LEDs from the elements. Creative Lighting Solutions offeres our LED Flexible Ribbon Strips in full spools or precut 12 inch strips for your 12vDC application. Call us at 1-877-877-2340 or visit us on the web at http://www.CreativeLightings.com today for more information on this exciting new lighting product! (c) 2009 Images copyright Turn2Photography. All rights reserved. Licensed to Creative Lighting Solutions, llc.